As recently experienced by a number of Apple users, next generation launches of old products can be a great excuse for manufacturers to do little to improve product design while doing a lot to increase the cost. When anglers heard about the revamp of the 2019 Hobie Outback, more than a few likely had their doubts. The company has, after all, released new generations of the Outback without changing much. That is not the case this time. With the redesign, it feels like the company truly took time to figure out what anglers didn’t like about the 2018 and older models and did what they could to change it. 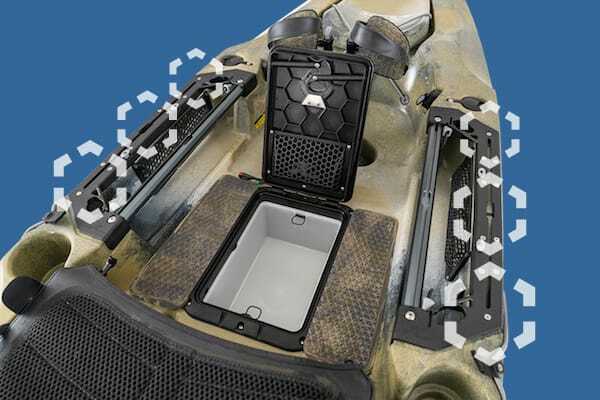 To begin, Hobie has long annoyed anglers with their gear mounts and H-Rail systems, which are Hobie patented and not easily compatible with the otherwise fairly universal gear tracks. We’ve called them out in numerous posts and reviews. On the new Outback, the proprietary H-rails have been joined by cross-compatible tracks that run parallel to each other on either side of the captain’s chair. Toward the stern, there are two additional gear tracks. The region of the kayak also holds many bungies to which you may attach gear like pliers and such. Now you don’t need to have that awkward conversation with Grandma when she gets you that sweet track mount for your birthday but you’re riding the H-Rail. Put simply, this is huge. Hobie may take a hit on accessories, but should see a bump in overall sales as a result. Another common complaint with the old Outback was that it was narrow. For those anglers who like to stand up while kayak fishing, there wasn’t a whole lot of room to shuffle around. Hobie increased the area of that space in addition to expanding the width to 34” (it was formerly 33”). Another huge point of vulnerability with all pedal drive kayaks is the cables connecting the rudder system to the steering levers. There were reports that the cable tended to break easily. The Hobie Pro Angler made some serious waves by introducing the steering lever on both sides. The Outback, however, goes even further by making those dual side steering levers independent. If one breaks, you’ll still have the other to get you back in to shore. It basically makes the levers into a redundant system. Another update comes with a revamped bow steering container. It’s shaped differently, closes differently and the old bow storage bucket won’t fit in this one. That might be the only downside. Thank god the cupholders are still the same size. The company likes to talk at length about the new hull design as well, which apparently tracks better in the water and is more stable. The jury is still out on that one. It also comes with Turbo fins standard (Hobie’s bigger pedal drive fins) and the Guardian Transducer Shield. This protective device also allows transducers to retreat up into the hull upon impact with an underwater obstacle. Like the latest iPhone, Hobie did raise the price on the new model from $2,549.00 to $2,799.00. But the new vessel might also save you the difference with the increased compatibilities it offers. If you are migrating to Hobie from any other brand, then definitely, yes, go with the new Outback. In fact, if you are definitely buying a new kayak right now, you would not go wrong with this one. Editor’s Note: We’ll be updating our Hobie Outback Review just as soon as we can! Featured image courtesy Hobie USA.